I have being using this shoe since middle of April, but now they already have a hole. The fit was quite good and the break in was really fast (I don't fit the shoes too tight anyway). 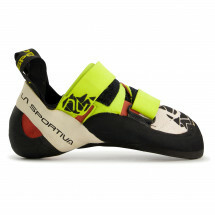 I have used them for indoor bouldering (around 4 times a week) and outdoor for bouldering and top rope, mainly sandstone. They were quite good, but in comparison with my previous Miura lace women, I was happier with the Miura and the fit was 100% perfect for my feet (narrow heel, high arch, and problems filling the heel cups). In general they were a nice all rounder comfortable kind of shoe, that you could wear for quite a long time and they did the job. The only thing that I didn't like is that the rubber in the sole in the lateral inside it detached, and a friend had a same problem with his male version. But I didn't feel that it affected my performance, even though I am being climbing only 1 1/2 years so I am not climbing high grades.